Sauret, Émile, 1852-1920. Concertos, violin, orchestra, op. 26, D minor (Album leaf). Violin concerto in D minor, op. 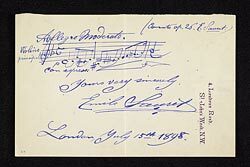 26 (album leaf): autograph manuscript, 1898 July 15.